Sometimes you just have to have the right tool for the job. This sewing needle threader is not it. DD has lost 2 jackets at school and I have no idea how this happens when I clearly write her name on the jackets with a Sharpie. Yes, sometimes the other kids might have the exact same jacket, but surely they are their parents should be able to tell which one belongs to their kid, right? So... 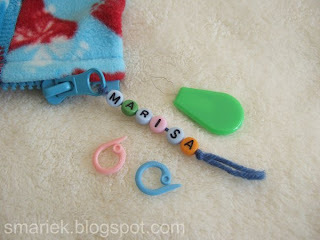 I decided to pick up some alphabet beads from Michael's and use that to string her name onto the jacket zipper pull. Now this should get their attention, right? I mean, these kids do know how to recognize their own name, and hopefully the parents can too. I'm not into beading so my challenge was trying to thread the blue fingerling weight yarn through the itty bitty hole on these beads. 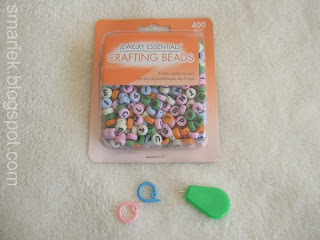 The threader & stitch markers in the photo above should give you an idea of the bead size. I mangled the needle threader in the process of getting those 6 beads onto the yarn (it actually took me a couple extra tries to get the letters oriented correctly). I don't know if you can clearly see how mangled the wire is from the photo above. I went back to Michael's and browsed the beading section and found these. They're collapsible eye needles. 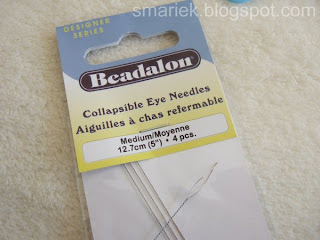 It's pretty much like a sewing needle threader, except that it's got a long thin "handle" which you can slide a bead onto. Perfect, this looks exactly what I need. My second attempt at stringing these beads went much quicker! I also picked up some pony beads for her to make necklaces and bracelets. She loves to thread yarn through the pony beads. It's neat to see how she chooses the sequence of colors. Yesterday, the Little One lost the purple hat I made her 2 years ago. Fortunately, she was able to find her hat today. One of her friends at school spotted it outside. Yay! I'm glad because we're having a cold spell (freeze warnings a couple days ago) and she really needs to wear a hat outside. Today, I dug out some worsted weight machine washable acrylic/wool to make another hat for her. I've only gotten as far as the brim ribbing. What a refreshing change it is to knit with 5mm (US8) needles vs the 2.75 mm sock needles. You definitely get more mileage. I wish I had some machine washable chunky yarn for instant gratification. I finished the purple mitts (you saw the left mitt here) and thought I had photos to upload, but I can't find them on the computer, so they must still be on the camera. I think these mitts will go to Miss Sussan, one of DD's teachers. I've cast on for another pair of identical mitts for DD's other teacher, Miss Vanya. I have to have it finished and ready to gift on Dec 18, the day of the Christmas Party at school. I have a sock in progress to show you, some yarn I've chosen for my Doctor Who Scarf, and a couple of washcloths ... those photos are on the computer, but I'm too tired to type something up about them at the moment. I've been trying to shake off some sort of head cold/sinus thing and have been feeling exhausted lately. My allergies have also been giving me aggro this month; I'm going to take an antihistamine and go to bed soon. Oh and to add to my issues, the Little One came home today with a fever of 102.9°F. I'm hoping she'll feel better tomorrow cuz I'm really not feeling up to keeping her at home tomorrow. Ok, it's time for me to finish my tea (Celestial Seasonings Perfectly Pear), take my antihistamine, and go to bed. On another tea related note, I just discovered that my local Safeway finally carries PG Tips!!! Yay! They only have the 40 bag box, not the 80 bag box. George might be cold, I had a couple of these fish, when I moved them closer to the heating vent they perked up and did much better. I like the jacket idea, I remember from years ago when my little Michael's jackets would vanish, this would have been perfect (done in boys colors of course). I had a beta fish in college - his name was Gordon Shimelfinny and he was blue. He lived to be about 1.5 yrs old...which I think is a long time for them. I do agree with Jean's comment about the cold...maybe layer some yarns around the outside of the glass? Also, your zipper pull idea is great! 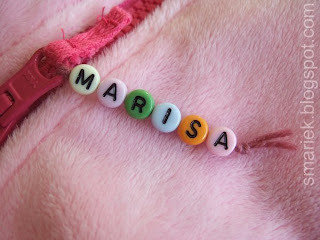 I have a small daughter and her things are always getting mixed up at daycare. Thanks for the tip. And I just have to laugh that all the blogspot "commands" for leaving a post and reading the next post, etc are in French. Lucky for me that I know French, but why are they not in English? Zipper thing is just perfect! We had a beta and the key for us was not to feed him every day and keep him on the warmer side. We only fed him every other day and switched out a cup of water (because that is how much the cats would drink from his bowl every day)every day. The fish bowl was the cats preferred water bowl, even though they had fresh water by their food bowl, I guess the fish water was tastier and the cats never bothered the fish, just drank his water. Our betta's done wonderfully since we put him in a heated tank. He's only gone off his feed once and we just fasted him a day or so until he was actually hungry again and it's been fine since. When he's lethargic, is he sitting on the bottom of the tank or near the top? Does he swim nose down? It could be that he's got Swim Bladder Disease, or Constipation. Does he have any salt in his water?